It’s rare for politicians of the same party as the president to withhold their support for a president who declares his intention to seek re-election. That is what is happening within the Republican Party. 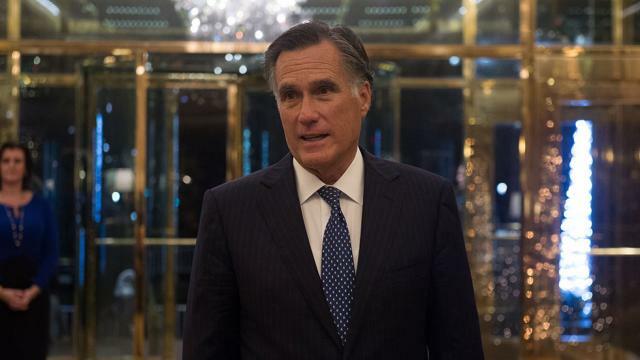 Mitt Romney, who wants to represent Utah in the U.S. Senate, says he cannot commit to supporting Donald Trump, who Romney once described as a “phony” and a “fraud.” Same for Sen. John Cornyn of Texas; ditto for Sen. Ron Johnson of Wisconsin; also ditto for lame-duck House Speaker Paul Ryan, also of Wisconsin. Is the president, um, toxic to Republicans? Are his GOP brethren afraid to get too close to the guy who is the titular head of their political party? Hmm. Maybe they’re looking at recent history. Trump backed a sitting U.S. senator from Alabama, Luther Strange, only to watch him lose that state’s GOP primary to Roy Moore, the guy accused by several women of sexual assault; Trump then threw his backing behind Moore, who ended up losing to Democratic U.S. Sen. Doug Jones in the special election. Trump then backed a Republican candidate for the U.S. House in Pennsylvania. Oops! Then the GOP candidate lost to the Democrat. I’m thinking the Republicans might be taking stock of the president’s actual political clout, looking past the braggadocio that flies out of the president’s mouth. Trump boasts about all the “winning” he has brought to government and to public policy. 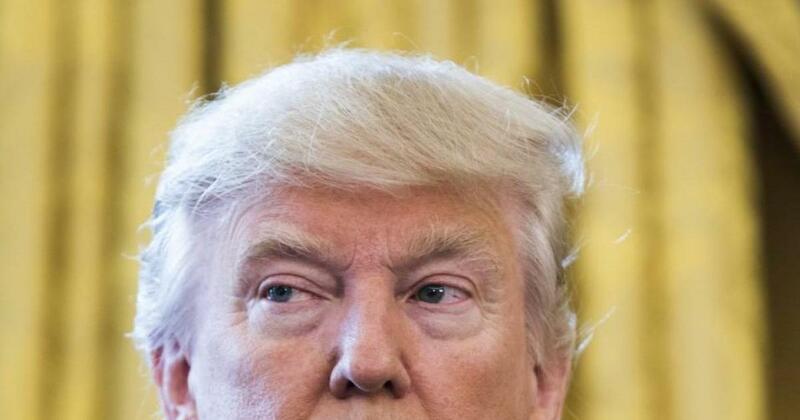 The way I look at it, he isn’t winning nearly as much as he would like us all to believe. The act of “winning” in Trump’s world bears no resemblance to the reality the president is facing as he confronts what is looking more and more like a difficult ride through the 2018 midterm election. That, of course, presumes the president is able to discern the politically obvious. Of that I am not at all certain. Trumpcare is in trouble. There’s no way to spin this any differently. Nine Senate Republicans are now on the record that they oppose their party leadership’s version of the alternative to the Affordable Care Act. Senate Majority Leader Mitch McConnell, who is as adept at tea-leaf reading as anyone in Washington, delayed the vote on the GOP plan until after the Fourth of July recess. I live out here in Flyover Country, in the heart of Trump Land, where the president polled something like 80 percent over Hillary Clinton in the 2016 presidential election. But my gut tells me that rank-and-file Trumpkins are none too happy about what the GOP Senate leadership has come up with. We’ve got a lot of folks out here who depend on Medicaid to cover the cost of medical care. The GOP plan guts Medicaid. A lot of those same folks voted for Donald J. Trump on his promise that he wouldn’t touch Medicaid, or Medicare, and would ensure a better, cheaper, more efficient health insurance plan than the one provided by the ACA. He isn’t delivering the goods, based on what the House of Representatives has approved and what’s on the table in the Senate. Republicans can afford to lose just two votes in order to approve a Senate version of Trumpcare. They hold a 52-48 majority in the Senate; two “no” votes means Vice President Pence casts the tie-breaking vote to approve Trumpcare. McConnell said today that Democrats have no intention of working with Republicans to craft an ACA replacement. Really! How about this, Mr. Majority Leader? 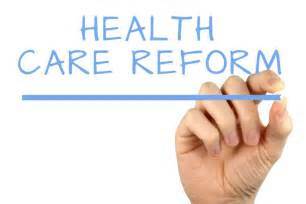 How about agreeing to preserve the good aspects of the ACA and work to improve those elements that need work? I’ve heard Democrats say they would be willing to with Republicans to mend the ACA. One of them happened to be the former president, Barack H. Obama, who has said repeatedly that if Republicans can improve the ACA he’d be willing to work with them. Obama is out of office now. Republicans are in complete charge. They control Congress and the White House. They had eight years to come up with a reasonable alternative to the ACA. 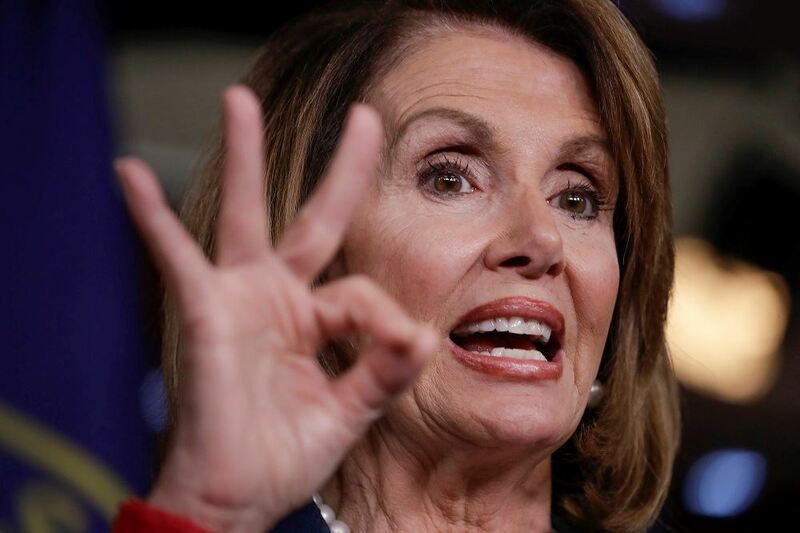 They dickered, dawdled and dissed the Democrats for that entire time and then came up with a plan that cannot please enough Republicans to make it law. Cue music. The dance goes on. Jason Chaffetz is about to walk away from his public service job as a member of the U.S. House of Representatives. Before he goes, he is leaving with a parting gift in the form of an idea that fellow House members ought to reject out of hand. Chaffetz thinks Congress should enact a $2,500 monthly housing allowance for its members. It would give members of the House and Senate a little bit of financial cushion to enable them to live like normal human beings. I don’t think so, young man. Chaffetz earns $175,000 annually to serve his Utah congressional district constituents. It’s a handsome salary to be sure. However, during his time in office, Chaffetz decided to perform a bit of a publicity stunt by sleeping on a couch in his office, rather than renting an apartment/condo/flat somewhere like many other members of Congress. I’ll stipulate that $16 million doesn’t measure up when compared to the size of the federal government budget. It’s not even significant compared to the size of the annual budget deficit, let alone the national debt. It’s still 16 million bucks. Boil that down to terms as they relate to me — and perhaps most of you who are reading this post — then we’re talking about some real money. I wish the Utah Republican well as he embarks on a new career and life, reportedly as a “contributor” to the Fox News Channel. He represents a political party, though, that prides itself on personal responsibility and fiscal prudence. Tossing potentially another $16 million a year at Congress to create what amounts to a public housing fund for well-compensated lawmakers, though, strays a bit too far from the GOP’s long-standing tradition. As I look over the outlines of the congressional Republicans’ effort to repeal the Affordable Care Act, I see precisely one element that’s worth supporting. That would be the end of the “individual mandate” that requires all Americans to have health insurance or else face a federal penalty. That particular part of the ACA has bothered me from the get-go. The rest of it? I cannot accept what the GOP has tried to do — in secret, with no Democratic input, no public testimony (other than the angry rhetoric members of Congress have heard at town hall meetings across the country). This is star chamber legislation, despite what Senate Republican Leader Mitch McConnell today said to the contrary. Which brings me to my major point. The process stinks to high heaven. Yes, it stinks even more than the way the ACA came into being, which wasn’t ideal, either. Still, the Democrats who ran Congress in 2009 at least were able to solicit public commentary while seeking in vain for contributions from their Republican colleagues in crafting the legislation. The Hill story on Obama post is here. Why is it mean? It gives tax breaks to the wealthy; it rolls back Medicaid insurance for poor Americans; it wipes out federal money for Planned Parenthood, a major contributor of health services to women. The Senate version of this new measure resembles the House version. The House managed to approve it with a 217-213 vote. Today, four conservative GOP senators said they can’t support the Senate version, which — if they hold their ground — dooms the measure. McConnell is going to tempt them with goodies and other amendments. We’ll have to wait for whatever rabbit McConnell pulls out of his hat. If the end justifies the means by which congressional Republicans have cobbled this legislation together, then we’re witnessing an exercise in political cynicism at its worst. The GOP aim — to my way of thinking — has been solely to strip Barack Obama’s legacy of this landmark law. Let’s all wait now for the Congressional Budget Office — the famously non-partisan auditing agency — to “score” this latest GOP monstrosity. If the numbers show what previous CBO analyses have revealed — that millions of Americans will lose their health insurance — then we’ll get to listen to GOP lawmakers criticize the CBO for being too, oh, dire or negative. The dance, then, will continue. Impeaching a president of the United States isn’t for the faint of heart. It requires a stout gut among those who bring it, not to mention the target of such a drastic action. The bar must be high. It must have a solid basis on which to make such a move. Where am I going with this? I have this sinking feeling that the current president well might find himself in the crosshairs of those who want to bring such an action against him. We’re hearing a growing — but still muted — rumbling in D.C. about the prospect of Donald J. Trump facing impeachment by the U.S. House of Representatives. I’m attaching an item from The Hill in which former Labor Secretary Robert Reich — an acknowledged political liberal — has lined out at least four impeachable offense already committed by the president. Will any of this come to pass? I have no clue. Think of the politics of it. Trump is a Republican; both congressional chambers are controlled by the GOP. Will the Republican House majority bring articles of impeachment to a vote, no matter how seriousness of whatever charges are considered? The collusion matter strikes me as the most serious and the most likely to align Republicans along with Democrats in considering whether to impeach the president. I am not suggesting there is, indeed, proof of such collusion. Remember as well that the GOP-led House managed to impeach a Democratic president, Bill Clinton, in 1998 on three counts relating to his seedy relationship with that White House intern. Conviction in the Senate, though, required a super majority of senators; the GOP fell far short on all three counts. Thus, the president was acquitted. They based that impeachment on the president’s failure to tell the truth under oath to a federal grand jury that questioned him about the affair. He broke the law, Republicans said. There was your “impeachable offense,” they argued. My major concern about the Clinton impeachment was whether the president’s offense had a direct impact on his office. It did not. Any of the issues that Secretary Reich lists, however, certainly do have a direct impact on the president’s ability to perform his duties. The bar for whatever might occur with the current president is set even higher than it was for President Clinton, given that the president and the congressional majorities are of the same party. You might not believe this, but I do not prefer an impeachment to occur. I do, though, want the unvarnished truth to be revealed about what the president thinks he can do with — and to — the exalted office he occupies. If the truth is as ugly as some of us fear, then Congress should know how to repair the damage. 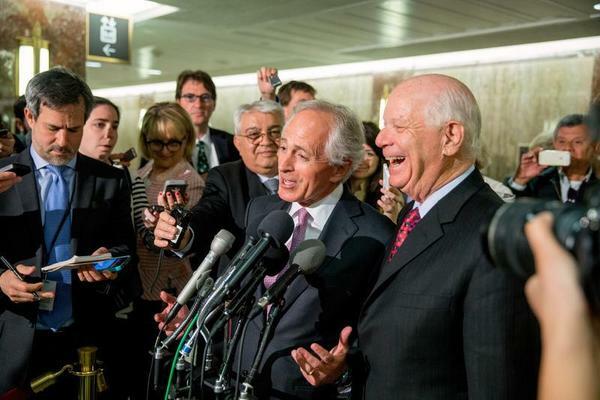 You see two U.S. senators — Republican Bob Corker of Tennessee and Democrat Ben Cardin of Maryland — yukking it up after the Senate approved a measure to require senatorial review of the Iranian nuclear deal worked out by the Obama administration with the mullahs in Iran. Why is this picture so noteworthy? It’s because the measure passed 98-1 in an overwhelmingly bipartisan manner. It’s not often these days you see Democratic and Republican congressional leaders standing side by side in front of cameras to bask in something they’ve done together. They did so this week. What’s brought the smiles to both men? 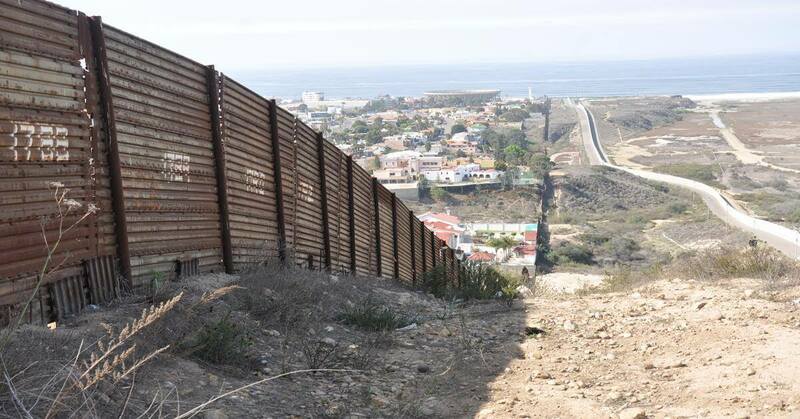 It’s a measure that says the Senate gets to sign off on a treaty that administration officials hope to finalize later this spring or perhaps in early summer. It calls for Iran to scale back dramatically its nuclear development program and its aim is to prevent Iran from developing a nuclear weapon — which Israel says it intends to do and which no one this side of Tehran wants to occur. It’s good that the Senate and the House will weigh in when the time comes. The lone “no” vote came from upstart freshman Republican Sen. Tom Cotton of Arkansas, the author of that letter that GOP senators sent to the Iranian mullahs threatening to void any treaty that President Obama signs. I prefer to hope that the Senate will deliberate this treaty carefully when it arrives on Capitol Hill. I also prefer that it do so in the same bipartisan spirit it showed in approving the measure granting its authority to do so. Now the House of Representatives will consider it. Follow the Senate lead, House members.